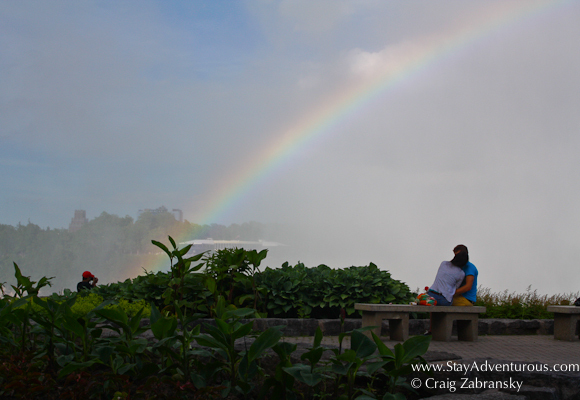 Through the years Niagara Falls has always been known for romance. Whether the perfect honeymoon, romantic retreats, package deals, or just an escape to a border; romance both manufactured and real exists besides the Natural Wonder. With adventurous activities, nighttime strolls, and sunset views from the Skylon Tower, there is plenty to do and entice. Regardless of what fills your day or night, there is just something romantic about the sounds, sensations and sight of these majestic falls. Well, this couple thought so. Happy Valentine’s Day. The rainbow makes it! My son just came back from there today. I bet it didn’t look like that. A great photo choice. Happy Valentine’s Day.